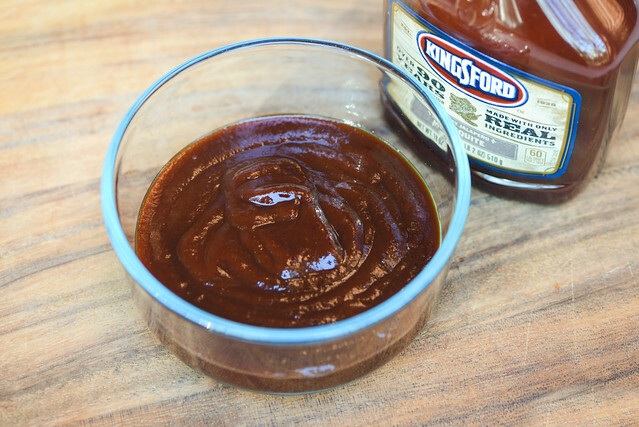 Kingsford Mesquite delivers on the strong smokiness you would expect from its name, but also brings along a very good balance of sweetness, tang, and heat to form a bold profile that's more balanced and nuanced than the standard supermarket sauce. Charcoal briquettes and Kingsford are pretty synonymous in the United States and for good reason—this type of a charcoal manufactured from wood byproducts has been around since the 1920s when Edward G. Kingsford developed them as a use for sawdust leftover from the production Ford cars. 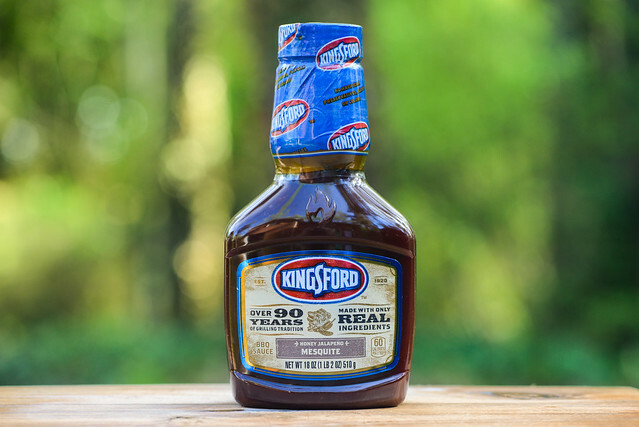 Since then, Kingsford has done a lot to make their briquettes meet performance standards in lighting, heat output, and longevity, but more or less, they've been known for the same product for almost 100 years. 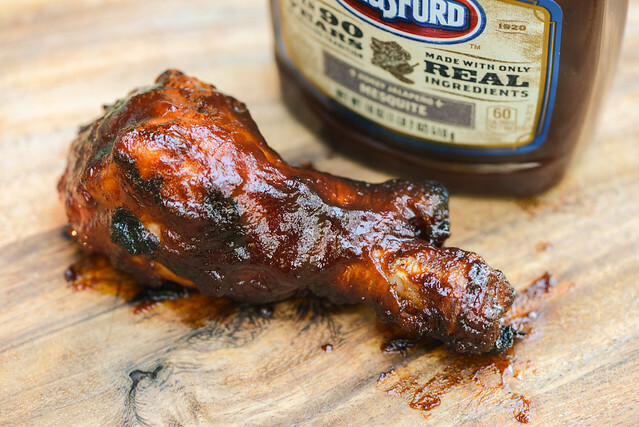 To complement their bread and butter charcoal business, Kingsford recently released three varieties of barbecue sauces that can be found in local grocery stores. Mesquite generally imparts a very heavy smoke flavor, and that is evident on the first whiff of this sauce that has a strong, pungent smoky aroma. Sitting alongside the smokiness is an almost equally upfront sweet molasses smell with an acidic tomato sitting right behind it. Although more paste-like, the tomato does introduce a little bit of bright fruitiness to the party. Hiding in the background are minimal notes of onion and a faint hint of hot peppers that struggles to come out from behind the otherwise sweet smell. This maroon sauce has a semi-glossy sheen and slight texture to it. It's pretty opaque, making it impossible to see any of the spices. Its consistancy is between medium and super thick, which leaves the sauce falling first in one large glob off a suspended spoon. After that initial big release of sauce, a few smaller drops slowly follow, then all movement ceases and a thick layer of sauce is left clinging, totally obscuring the silverware. There's a syrupy sugar start to this sauce that quickly gains depth from a mix of molasses and tart tomato. This creates an initial standard balance between sweet, fruity, and tangy that adds in smoky next with a strong, but not overpowering, mesquite flavor. As the sauce settles on the tongue, another wave of sweetness hits and keeps that smokiness from becoming too dominant and this allows faint tastes of garlic and onion to come out before things turn spicy. The heat is mild and balanced at first, but by the time the sauce has left the tongue, there's a strong burn that melds with the other flavors to create a spicy, smoky, and tart aftertaste. The sauce coated the the chicken in a medium-thick layer that never completely baked down over indirect heat. This led to higher than normal burn off over direct heat, and led me to apply an extra brushing of sauce at the end. The sauce's flavor tilted to be more sweet and fruity after being cooked. The jalapeño was noticeably more pronounced, which created additional fruitiness, but not more heat because cooking the sauce had concentrated and heightened the sugars, which balanced out the spice. The smokiness and tanginess backed down a little bit, which helped further bring that sweet molasses and tomato flavor to the forefront. I shuttered a little when I read the "Mesquite" label on this sauce, being all too familiar with how commercial sauces over do it with the liquid smoke and worried the intensity of mesquite would push this sauce too far into pungent territory. I was left surprised though when I wasn't off put at all by what was a heavy smokiness that made a lot of sense when paired with the equally strong sweetness, tang, and heat. These all came together to form a bold sauce that was balanced and had interesting and pleasing layers of flavor. That strong tang and smokiness mellowed after being cooked, leaving an even sweeter flavor profile that I thought most people would really enjoy. Out of the three Kingsford sauces I was sent to sample, I wrote this one off by the name alone, but learned not to judge a sauce by its label as this one had a strong, but balance profile that gave my chicken a lot of flavor and would do great on ribs and beef as well, landing it a notch higher in my eyes than its other supermarket sauce brethren.